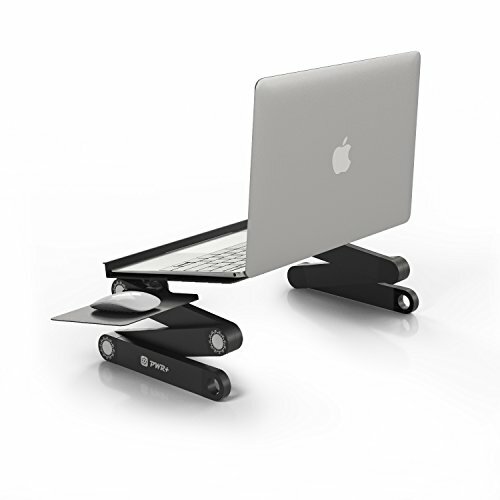 Pwr+ laptop table helps reduce the operating temperature of your laptop and allows for steady airflow around it. It uses active cooling methods to distribute air quietly and evenly under the base of your laptop or netbook. Powered by your laptop's USB port (usb cord is included), two silent fans use so little energy that it won't even have any impact on the battery life. It is the legs that make the table so unique: with its adjustable auto-locking joints that rotate around 360 degrees it can hold things in a variety of configurations. Wherever it is used - be it a desk, sofa or your lap - Pwr+ table provides a most comfortable typing angle and reduces neck and shoulder stress thanks to its unique design and shape. And it is a perfect breakfast tray also! compatibility: acer aspire one, m5 r7 s3 s7 v5; Travel Mate/ apple MacBook 13" 15" 17" (pro, air, Unibody) PowerBook g4 / ASUS VivoBook, Zenbook prime, Eee pad transformer book trio, infinity, Taichi, ROG / dell Inspiron, latitude, XPS 12 14, precision, Alienware, Vostro/ FUJITSU Lifebook / HP pavilion, envy, Spectre, split x2; EliteBook folio, ProBook, ZBook; Compaq Presario / LENOVO IdeaPad, yoga; ThinkPad, x1 carbon, twist / PANASONIC Toughbook / SAMSUNG ATIV book 2, 4, 5, 6, 7, 8, 9, lite, plus, Chronos, smart pc, Chromebook 2 / SONY VAIO, tap 11, duo, flip / TOSHIBA satellite, Qosmio, KIRAbook, Portege / MSI, gateway series. NO ASSEMBLY REQUIRED / QUIET USB POWERED CPU COOLING FANS - Connect USB Cord (Included) to Your Computer to Power The Quiet Cooling Fans.